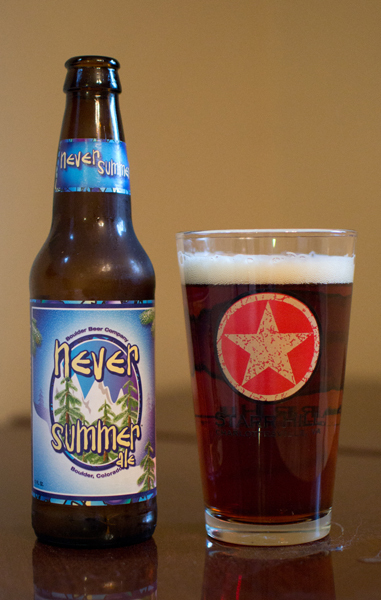 Beer #325, only 40 more to go, is Never Summer Ale by Boulder Beer Company from Boulder, Colorado. 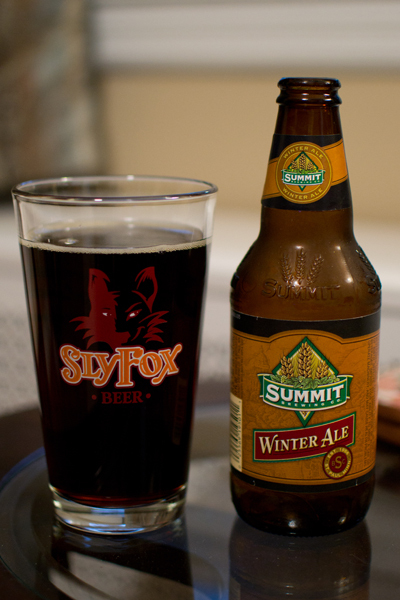 This Winter Warmer (I know…it is only autumn) has an ABV of 5.94%. Appearance – Clear amber with a reddish tone with a off-white head. Nose – Caramel malts, toasted bread…nothing else. Taste – Very much like the nose…caramel and toast with a bit of a spicy, peppery flavor and pine hop thing near the back end. Mouthfeel – Medium body, light carbonation, slight bitterness. Overall – For a Winter Warmer…it didn’t warm me up at all. I was expecting a bit more spice here and a bit more alcohol presence…something to remind me of winter and keep me warm on those long cold New Jersey winter nights. Hot …hot…hot…but what do you expect here in sunny Florida. Today was a total do nothing day. It was the perfect day to lounge by the pool, soak up the rays, take a dip in said pool, slide uncontrollably down a totally dark water slide (cackling all the way), and read a good book. That book by the way, Stephen King’s Full Dark, No Stars had a reference in it to Pliny The Elder that I will have to investigate. Beer #127 here in Florida does not come from the Sunshine state…but from North Carolina. It is Cold Mountain Winter Ale by Highland Brewing. 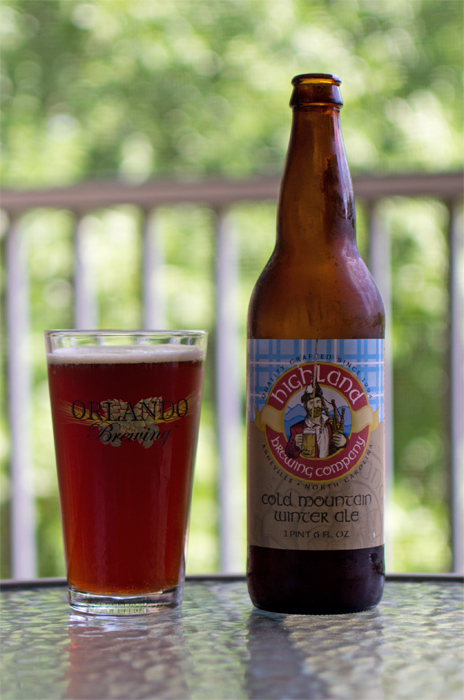 Highland Brewing is based out of Asheville, North Carolina and brews this Winter Warmer with an ABV of 5.8%. Whats that you say, a Winter Warmer in the heat (88 degrees today) of Florida? Sure…why not…after all it is ice cold (from the air conditioning) back in the room where I will be enjoying this. To the pour…a brown with some red tones when held up to the light was the color of this brew. It had a minimal tan head. To the nose…sweet caramel, molasses, bread…another words, very malty. To the mouth…not as sweet as it smelled. There were some nice flavors here…caramel, toasted bread, a bit of chocolate (think cocoa), brown sugar, a bit of vanilla, and roasted coffee near the end. There was a very slight hop bite near the end but overall this was delicious. To the feel…it was medium bodied, creamy, and had a small amount of carbonation. This was a really easy beer for me to drink. I enjoyed this much more than I thought I was going to. It had a lot of really nice flavors, complex in the flavors you could say. This is an excellent beer and makes me want to try out some of Highlands other offerings. KingBob approved! To kick off the week before Christmas, I thought I would try beers with some sort of winter or Christmas theme. If it has winter in the name or maybe a label with good old St. Nick or something similar, it is good enough for tasting during the week. Beer #21 is Winter Ale by Weyerbacher. Weyerbacher is located in Easton, Pennsylvania. 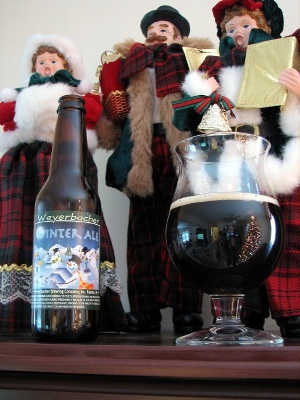 Winter Ale is a beer in the style of a Winter Warmer. A Winter Warmer is an ale with a big malt presence usually on the sweet side that is brewed in the winter months. This Winter Warmer has an ABV of 5.6%. This ale poured a deep dark ruby color with a small tan head. Aroma was sweet malts with some chocolate that kind of reminded me of a stout. There was also a faint alcohol scent buried in there. Down the hatch it went and this tasted just like it smelled, sweet malts followed by chocolate. It is smooth in the mouth and sort of on the heavy side with very little carbonation. It is an easy beer to drink but I really did not want another. I thought it was a rather unremarkable beer. Nothing stood out to me to make me want another. This wasn’t the best way to start out Christmas week. I hope it gets better as the week goes along. Something tells me it will.